The Mahindra XUV 500 facelift gets a makeover along with an automatic option in all the variants except for the base W5. Prices start at Rs 12.32 lakh and go up to Rs 17.88 lakh (ex-showroom Mumbai). Mahindra and Mahindra has finally launched the updated version of its 2018 Mahindra XUV500 SUV in India at Rs 12.32 lakh (ex-showroom Mumbai). Most changes in the XUV are cosmetic; however, it now gets an automatic transmission choice with each of its variants, barring the base W5 trim. And on that note, there’s a new nomenclature in place now, the 2018 XUV 500 variant names read – W5, W7, W9, W11 and the W11 Optional. It continues to get the petrol version in a single G variant, which is now offered in automatic option only. New Mahindra XUV500 Vs Old XUV500 – What’s changed? The new XUV gets plenty of cosmetic changes on the outside. This includes a redesigned front grille with chrome inserts arranged in a different pattern compared to its predecessor; DRLs (daytime running lights) in the projector headlamp unit and sporty diamond cut 18-inch alloy wheels. Head to the rear and you’ll be greeted by a new split wraparound tail lamp unit extending towards the sides and the rear of the SUV. Twin exhausts, rear spoiler and chrome-garnished tail gate appliqué give some air of refreshment to its rear. The 2018 XUV500 SUV ups the ante when it comes to cabin premium-ness. Tan leather seats offer a rich experience inside the new Mahindra SUV. Imbibing a sense of plushness are the soft-touch leather dashboard, electric sunroof with anti-pinch and a new piano black centre console. It continues to carry the good traits of its predecessor such as 8-way power-adjustable driver’s seat, sporty twin pod cluster, icy-blue lounge lighting, illuminated scuff plates, cooled glove box and logo projection lamps on ORVMs. 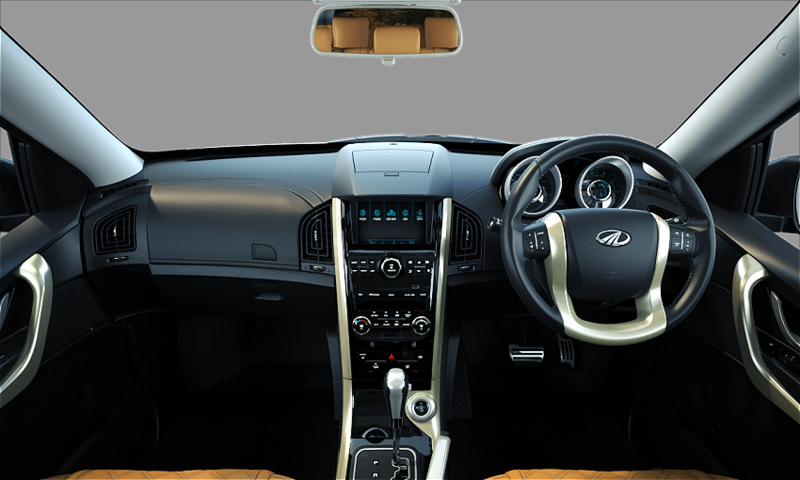 It gets the smart watch connectivity which syncs with its infotainment system and you can wirelessly take control of audio, temperature and several other features in the XUV500. It comes with a 6-speed automatic transmission which also gets creep function (a real boon in bumper-to-bumper city traffic) and a manual mode option. What’s new is that you can now have the convenience of the automatic in all the XUV variants except for the base W5 trim. Mahindra has an ace up its sleeve when it comes to safety. The list of new XUV500 safety features include 6-airbags, hill descent control, hill hold control and electronic stability program with rollover mitigation system. ABS with EBD, emergency call (segment-first), static bending headlamps and disc brakes on all wheels makes the Mahindra SUV a safe car to bet on. The homegrown automaker hasn’t fiddled with the engine of the new SUV. In fact, even the suspension continues to be the same. However, with the same 2.2-litre, 4-cylinder mHawk diesel engine, it now produces 155PS of max power (15PS more) and 360Nm of peak torque (30Nm more). It can be had with both the transmission options – a 6-speed manual or automatic gearbox. The 2018 Mahindra XUV500 SUV revives its rivalry with the Tata Hexa, Jeep Compass and the Hyundai Creta. READ LATEST CAR NEWS HERE!